This is a story of inspiration. I don’t focus on the past. I focus on potential. FROM THE ROUGH is based on the inspiring true story of Coach Catana Starks and her seemingly insurmountable journey to inspire a team of young athletes profoundly enough for them to believe in themselves and become champions – in their own lives. Catana Starks made history as the first African-American woman to coach an all-men’s collegiate team, overcoming many obstacles and silencing many naysayers to bring them to an all-time record championship season. I want this film to inspire women to do whatever they want to do,” says Starks. “I want them to believe in themselves and go out there and try new thing and don’t give up! It turns out, things worked out exceptionally well for many of Starks’ TSU student alums. Her recipe of tough love and continuous encouragement helped many young men go onto high achievement in and out of sports. Sam Puryear became assistant golf coach at Stanford University and the first African-American to coach a major conference golf team, which he accomplished at Michigan State University. Puryear is currently director of golf operations at Queens University in Charlotte. Adrian Adams and Sean Foley, her first international students are both doing well; Adams owns an investment firm and Foley went on to become Tiger Woods’ swing coach. Robert Dinwiddieher student golfer from the UK, is currently competing on the European tour. Rob Reed, an injured football player and one of Starks’ early golf students, is now head football coach at Tennessee State University who recently took TSU to the NCAA playoffs for the first time since 1969. The film’s title, FROM THE ROUGH, is derived from the term referring to an area of the golf course outside smooth terrain. In other words, “the rough” is the hard to maneuver, unsavory area that makes things difficult to traverse. Starks recalls her team struggling to defeat their opponents during a major game in New Orleans where they were playing on Bermuda grass. “That was the problem, it was tough to maneuver and I knew we were the better team,” she recalls, “so we went out and practiced some more and we worked on putting and we came back and won that tournament.” The film uses this phrase in homage to Steve Ballesteros, one of the greatest golfers in history, who was unique in training and practicing hitting from the rough first, and then learning the easier shots later. FROM THE ROUGH is a fitting title for a film that deals with overcoming the uphill challenges that life places in our path. You’re your own worst enemy, but if you can get out of your own way, who knows how much you can accomplish. 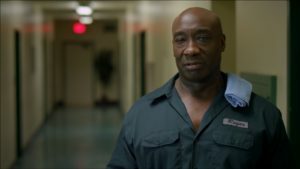 FROM THE ROUGH is one of the last films to feature a performance by the late Michael Clarke Duncan. 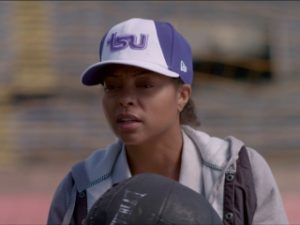 In it, Duncan portrays a quiet force at the university whose presence and constant encouragement helps Coach Starks recall her own strength, drawing upon it to succeed. “Roger doesn’t let anybody determine his worth but himself,” said Duncan, who was heartened by the film’s message of camaraderie as portrayed by a multi-cultural cast of characters. “This person’s white, this person’s from South Korea, this person’s from London, England…that’s doesn’t mean we all can’t get along and achieve something by working together as a team with a concerted effort. That’s what it’s all about,” Duncan shared. You can’t give up hope, because hope is everything. Loved this movie. I was so sad when it did not come out in theatures and took a risk buying it without seeing it first. Worth it! Watched it three times in the first week I got it. I love this film never knew there was a Black female coach for Golf. And how she taught those least likely to be the best. When we count ourselves out others see the best in us and help bring it out. And when men feel women are not capable and yet able to get it done with little means awesome. I was surprised that i enjoyed this movie. The underlying story was entertaining. I found it interesting that the strength of one person was able to overcome the administrative reputiation of a beneficial program. Doing her ususal great job of acting, Taraji portrays the main character quiet well but I think the story could have provided a deep reveal of the characters. Great sports story as well. Congrats to TSU and the pioneering experience that so many AA have had to endure. Great movie. Well written with great acting and story. It’s one of those jewels that people will miss because it didn’t make it to the big screen. It’s based on a true story about a golf coach from a small college in Tennessee. I highly recommend it as a great family movie. I laughed, I cried. I have played 13 years of football, 5 years baseball, and I can totally identify with the movie. Cheers!